You are here Home » Blog » What is the State of Your Organization's Print Infrastructure Security? Your organization invests a great deal of time, effort and resources into the development of intellectual assets, so it's important to protect your organization's intellectual property from being compromised or stolen. Open printer ports, printer web servers and FTP protocols are becoming a popular entry point for hackers, and unfortunately Print Infrastructure Security is an area that can often be overlooked, thus exposing organizations to potential security breaches. In order to determine whether or not this is the case, you should start by conducting a Print Infrastructure Security Assessment to pinpoint potential vulnerabilities. We then recommend that you implement software and business processes that will lock down the physical and digital print environment, automate print security and enable reporting and auditing capabilities. Unauthorized access is the use of a computer or network without permission. A cracker, or hacker, is someone who tries to access a computer or network illegally. Some hackers break into a computer or network for the challenge. However, others do this to utilize or steal intellectual property and resources, or corrupt data. Assess the access points - physical and digital - and protocols on your printer network and on all of your networked print devices, and identify which access points and protocols can be used as inroads for potential security threats. Determine what happens to unclaimed physical print jobs. When confidential documents get printed and left on work group print devices, what happens to these documents? Assess networked print device ports and protocols and identify which ones aren't being used. Determine which users are scanning documents and where these documents are being sent once they have been scanned on devices within the corporate network. Document all of the security vulnerabilities you discovered and develop a security plan to address each vulnerability. If your Device Security Policy is not comprehensive enough or you don’t have one that is formally documented, your organization may be vulnerable to security threats without even realizing it, so it’s imperative to have a formally documented Device Security Policy and ensure that it gets properly implemented. Make sure that your policy specifies and limits access to information AND network assets. This policy is the foundation for creating a secure network printing environment. Document management, often referred to as a Document Management System (DMS), is the use of a computer system and software to store, manage and track electronic documents and electronic images of paper-based information captured through the use of a document scanner, multi-function device or networked copier. Let's take a look at traditional paper-based filing. Rows of large document folders are put into these filing cabinets in the hopes of being stored correctly. Paper doesn’t keep a record of who has viewed it, copied it or scanned it, and it can be destroyed or damaged accidentally by things like a water pipe bursting, fire or the accidental spillage of coffee. Think of a Document Management System as a large electronic filing cabinet with folders that are stored in an unlimited number of drawers (based on hard drive space of course). Digital content is secured by user access rights. When documents are checked out, changed audit logs can track who has looked at the document, changed the document with version references and can even prevent unauthorized users from viewing and/or printing the document. The Document Management System's IT backup processes ensure that documents don't get damaged or destroyed accidentally, unlike those stored in paper-based filing systems. 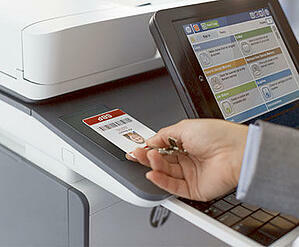 For many organizations it’s difficult to monitor and manage each and every user's print jobs. Many times print jobs are forgotten or sent to the wrong printer and documents end up sitting on the printer, never to be retrieved by the user. This is especially troublesome when confidential documents are left for everyone (even unauthorized users) to see. To prevent this from happening you should establish print workflows and automate print processes. A print workflow is the definition, execution and automation of business processes where tasks, information or documents are passed from one participant to another according to a set of procedural rules. FollowMe Printing allows users to print to a shared print queue, and roam and release their print job from any enabled output device. This ensures that printing remains confidential to a specific user and reduces printed waste from documents left uncollected at the printer. If a printer is out of service, users can release their print jobs from the next available printer, without disrupting productivity. Authenticating at multi-function output devices enables custom scan capture workflows to be presented at the panel. This process ensures secure access to retrieve printed content while using the devices as on-ramps to key line of business applications storing captured content. Tracking and reporting tools create transparency for all print costs, helping finance managers allocate or recover costs from individual departments or clients. Organizations can also use tracking data to help them comply with industry regulations such as Gramm-Leach-Bliley Act (GLBA), Payment Card Industry Data Security Standard (PCI DSS) and Sarbanes-Oxley (SOX). Strengthen information security and significantly reduce administrative overhead by utilizing automated print device security software that automatically deploys and updates print device identity certificates. HP Security Manager performs these automatic deployment and updates, and offers a simple, intuitive process for securing your print fleet. It efficiently deploys and monitors devices by applying a single security policy across the fleet, and secures new HP devices as soon as they are added to your network with HP Instant-on Security. Actively maintain and verify compliance with your defined security policies using HP Security Manager’s automated monitoring and risk-based reporting.